Rocket Matter Knowledge Base Trust Accounting How to view the trust ledger for a client. Trust Balance: This amount reflects the total amount of money being held in the trust account for this client, regardless of how many matters they have. 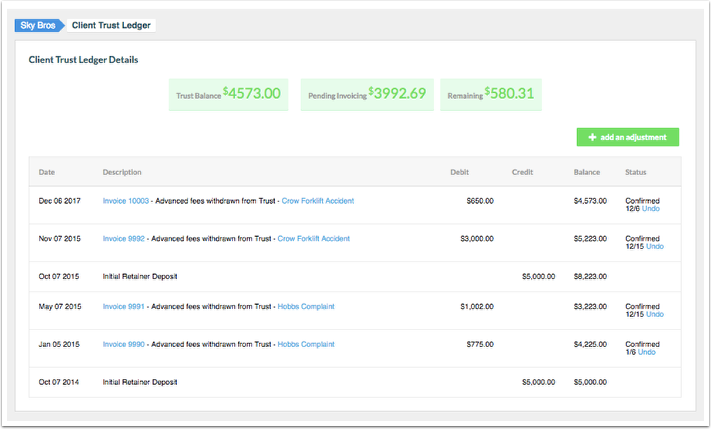 Pending Invoicing: This amount reflects the total amount of billable time, fees, and costs that have not yet been invoiced across all matter associated with that client. Remaining: This amount reflects the amount of money left over if any, after applying available trust funds to any pending invoicing amounts. Next: How to add a payment to trust.